We’re living history right now. Barack Obama was nominated by the party of Jefferson Davis and George Wallace to be President of the United States. An honor which was conferred on him by the first female Speaker of the House and the only First Lady to ever hold elected office. And it was done by acclamation. The sheer weight of these facts is knee-buckling. Which means it's time for something really idiotic to break the tension. It’s a lose-lose situation. At worst, they’re surrounding a candidate who has been smeared on religion with pseudo-religious iconography that was probably lifted from the set of Caligula. At best this Romanesque monstrosity will be seen as a monument to one man’s ego, instead of a stage for one party’s resolve. In a race that hinges on the DNC’s ability to prove that it’s in touch with common concerns, it's arranging for a Ceasar–esque coronation. 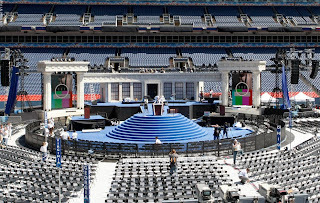 The appearance they're giving is that Obama is accepting the nomination from a podium that suspiciously resembles the Capitol Steps where he would be inaugurated. But the people who can sweep him into office would much rather he speak from the people's pulpit then the annals of legend. But maybe this whole thing includes a moonbounce for his kids so who knows. The McCain campaign has dubbed it “The Barackopolis.” Then again, they’d be wise to hide their affinity for ancient relics. Especially while they’re campaigning for one. I LOVE the set. C'mon -- let's just enjoy the mise en scene!!! And I hope -- I am optimistic -- that Obama's oratory will be up to the expectation. C'mon, Michelle, please -- make him practice!!! LOL LOL Good Post!! The Repubs are just hating because they didn't think of the same thing when the nominated Dubya. They know they're up against it this election; rather than define their platform, they prefer to attack a pulpit....no wonder we have an exploding deficit! Hmmm, regarding "ancient relics," the GOP may be going to the other extreme with McCain's selection of first-term Alaska Gov. Sarah Palin as his running mate. Not since Spiro Agnew has a VP candidate had less federal or state governing experience. (But hey, she does know about commercial fishing, outdoor recreation, and sports reporting.) Just think, with Palin's vast amount of inexperience, she could be a heartbeat away from the red phone. Palin is dangerously under-qualified to be President. 2 years ago she was mayor of a town of 7,000 people. Do the democrats really want to get into a debate about experience? Last I checked, the top of their ticket is a man who has only spent 140 days in the U.S. Senate. And what has he accomplished in that time? He's given a few good speeches. Palin, on the other hand, has actually accomplished something in 2 years of EXECUTIVE experience. And she has an 80% approval rating. No wonder the dems are on the defensive about this pick. Whoa! Do you know something we don't? Last we checked Sarah Palin is running for Vice President, not President. I do believe Joe Biden has a few more years of experience, not to mention accomplishments, under his belt. Experience is something that needs debating. And running for Veep is running for President-if-the-President dies. — Glenn Thrush, of Politico.com, reports that as mayor of Wasilla, Palin managed to run a town of 6,000 people $20,000,000 into long-term debt. This despite all the federal funds her Washington lobbyist helped her get. — At the same time she was mayor, Palin also opened a car wash. But as Matthew Mosk reports for the Washington Post, "the business ran into trouble with Alaska's division of corporations business and professional licensing..." — and the state shut it down. These things raise questions in my mind about the quality of Palin's performance as an executive. There are also questions in my mind as to the type of executive she's shown herself to be. — She's an active member of the Wasilla Assembly of God (Pentecostal). That I like. But it makes me nervous when I see a video in which she tells the congregation that the U.S. war in Iraq is "a task that is from God" and that "God's will has to be done in unifying people and companies to get that gas line [from Alaska to the Lower 48] built...." Oliver Cromwell, the profoundly religious ruler of Puritan England, once said, "I beseech you, in the bowels of Christ, think it possible you may be mistaken." That's good advice — for there have been many leaders on the losing side of wars, who were sure that God was on their side. - The editor of Wasilla's newspaper, according to Time magazine, says that as mayor of Wasilla, Palin asked the local librarian how she could go about banning books. The librarian was horrified. According to Time and also according to Andrew Sullivan of TheAtlantic.com, Palin then threatened to fire the librarian. — We know the charges that as governor, Palin may have tried to fire the guy who wouldn't fire her ex-brother-in-law. Andrew Sullivan reports that while mayor of Wasilla, Palin fired that city's police chief, a man with a solid record 22 years long, for "not fully supporting her efforts to govern". Does Palin run her operations by intimidation rather than inspiration and example? According to AlterNet, by the way, Greg Erickson, a reporter for the Anchorage Daily News, told the Washington Post that Palin's approval rating is not 80% but 65% and sinking. Republicans make much of the fact that Palin has "executive experience" and Obama has none. What I'm seeing as an independent is that Obama has shown exceptional generalship in his campaign. He set a record for raising small donations from ordinary voters, surpassing even Reagan. He used his resources strategically to garner a majority of convention votes, even while Hillary, his rival, was winning a majority of the popular vote. He stayed out of debt while doing this. And he has assembled a truly remarkable "brain trust" of advisors.